N'ai-je pas quelque chose de plus profond à penser? So I've been studying French, informally for almost three months now, judging by my previous blog posts. Since the week of Donald Trump's election. And Trump has been even worse than I expected these first two weeks after his inauguration. He is ripe for impeachment already in my opinion. And I'm ripe pour aller vivre a Montreal. Anyway, back to French. I'm in the middle of going through the online version of French in Action for the third time, and I am finally picking up on some of the jokes. The two lead characters are Robert and Mirielle, embarking on a romance, and Robert is quickly obsessed with Mirielle. So in this episode he is portrayed as constantly thinking about whether or not he will see Mirielle at dinner at Madame Cortois' apartment. Madame Cortois is a mutual acquaintance. The phrase: "Est-ce'elle sera chez à les Cortois " ("Will she be at (the house of) the Cortois?") is mentioned often throughout the episode. At one point the Mona Lisa whispers "je ne sais pas" ("I don't know') to Robert. So finally at the end, an image of Rodin's "The Thinker" is shown and Pierre Capretz (founder of the language system that is the basis of French in Action and host of the show) says: "Regardez Le Penseur du Rodin. Il a l'air inquiete, tendu, nerveuse. Vous savez pourquoi? Il se demand si Mirielle sera chez les Cortois." 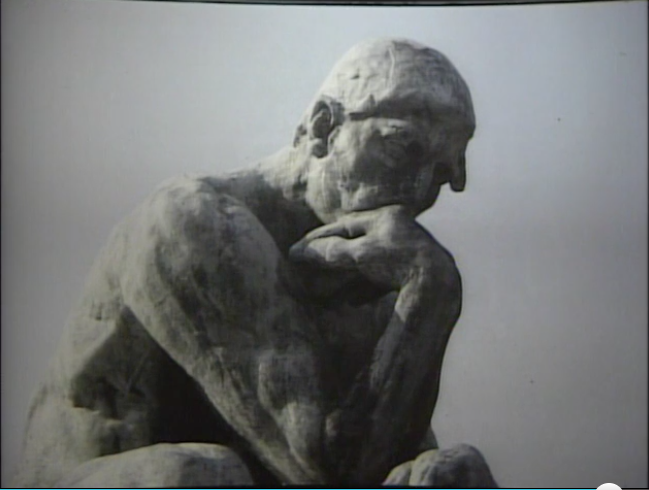 which means "Look at Rodin's 'The Thinker.' He is anxious, tense, nervous You know why? He's asking himself if Mirielle will be at the Cortois'." MDR! And then there is the episode where Aunt Georgette is having a bad time at a restaurant. I picked up during the first two viewings that she was upset because she wanted to order what the guy sitting nearby was having and they were fresh out... but I didn't pick up until the third time around that what she was ordering was "le tête du veau" - calf's head. Ugh!